The two equinoxes of March 21 and September 21st when the daytime and nighttime are each vey close to 12 hours long. To these, the Saxons added the two solstices of December 21, (the longest night of the year) and June 21 (the shortest night of the year). Actually, the exact date of these minor Sabbats vary from year to year and may occur from the 20th to 23rd of the month. The major Sabbats are also four in number. They occur roughly midway between the minor Sabbats, typically at the end of a month. Different Wiccan traditions assign various names and dates to these festivals. 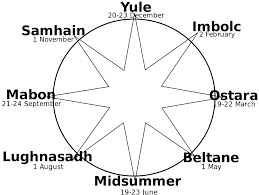 Perhaps the most common names are Celtic: Samhain (Oct. 31), Imbolc (Feb. 2), Beltane (Apr. 30), and Lammas (Aug. 1). The Sabbats are believed to have originated in the cycles associated with hunting, farming, and animal fertility in the Northern Hemisphere. Dates are approximate. Some Wiccans observe Sabbats within a few days of the nominal date. Dates are listed above are typical for the Northern Hemisphere. Dates in the Southern Hemisphere are usually offset by six months. Samhain (OCT-31) - All Hallow's Eve, All Saints' Day, All Hallows, Day of All the Saints, Feast of All Saints, Solemnity of All Saints, All Souls Day. Halloween, Samhain, All Saints' Day: Facts, misinformation, & links to web sites.